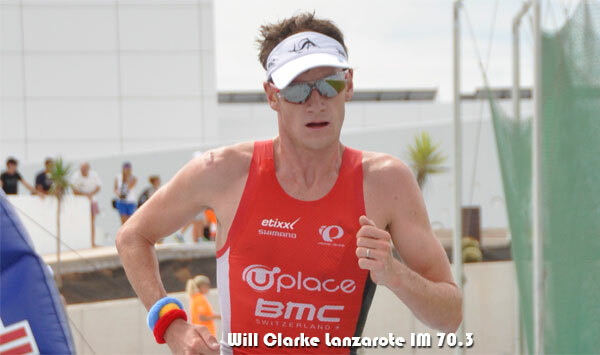 British Pro Will Clarke raced over the finish line at Club La Santa creating a new course record of 04:04:17, around one and a half minutes faster than last year. In the women’s field, Denmark’s Helle Frederiksen dominated from the start, taking first place on the podium. 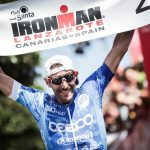 Clarke was the first to leave the 1.9k swim and led for the first part of the 90.2k bike course, before this year’s IRONMAN Lanzarote 2014 winner and strong cyclist, France’s Romain Guillaume, took the lead at Tabayesco Hill. 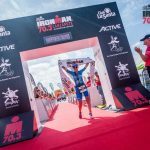 The Frenchman was in front until the last loop of the half marathon, before Clarke took the lead and last year’s 70.3 champion Victor Del Corral took second, leaving Guillaume in third. An exciting pursuit followed until the last 100m where cheering crowds witnessed an amazing finish, seeing a determined Clarke beat Del Corral, also the first Canarian resident, by only five seconds. 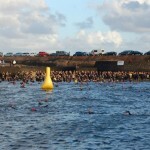 Frederiksen, the first woman out of the water with an impressive time of 00:22:27, almost four minutes before her nearest rival Lucy Gossage. The Danish mid-distance specialist continued to increase her lead throughout the event, finally claiming the title in 04:29:59, and even breaking the previous male course record. Gossage, who had experienced a few problems on the bike course, arrived around 20 minutes later with 04:50:05, and third placed Nicole Woysch from Germany crossed the finish line some 13 minutes after. 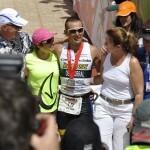 The first female Canarian resident to finish to was Helle Haurum.